Next month’s Community Board 3 agenda just landed in The Local’s inbox, and with it comes the list of bars and restaurants that will seek a recommendation in their favor for a license to sell alcohol, along with an assortment of other issues. Here’s a roundup. Nublu will seek approval for a renewal of its wine and beer license. Very little has been heard from the jazz club since the State Liquor Authority temporarily shut the place down due to its proximity to a Jehovah’s Witnesses Kingdom Hall. 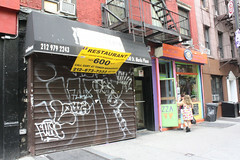 Though the club itself has not faced much controversy since then, neighbors who recently spoke out against the sandwich shop, Bikinis, implied that its owners were not trustworthy due to their association with Nublu. The Lobster Joint will also seek approval for a liquor license at its future location on Houston Street. Two days ago, its owner was on the street seeking signatures in support of his application. Paulaner Brauhaus, the large Bowery beer hall that has faced its fair share of construction and community board woes, will once again seek approval for a full liquor license. As has been the case since early this year, Nevada Smiths is on the agenda seeking approval for a liquor license at its new location. The soccer bar’s owner told The Local today he is hoping to open in October. Lauren Carol Smith The now-closed location of Nevada Smiths. 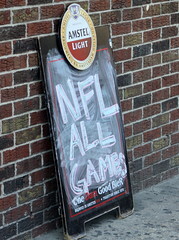 The popular soccer bar Nevada Smiths served its final beer last night, but there’s no need to behave like a hooligan: the staff will be showing games at Webster Hall until the bar reopens at its new location. Owner Patrick McCarthy told The Local that he planned on showing his first game at Webster Hall this weekend. A staffer at the nightclub and concert hall confirmed the arrangement. Grace Maalouf Tomorrow’s UEFA Champion’s League Final between Barcelona and Manchester United is certain to intensify the rivalries among the East Village’s European soccer fans. Above, Manchester United fans take in a match at Nevada Smith’s earlier this year. 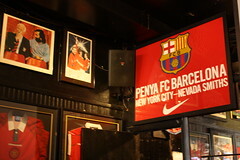 Below: Barcelona memorabilia at Nevada’s. Saturday will be a big day in the East Village, which, as you may have noticed, has a lot of Europeans living in it, visiting it, and — East Village merchants say Thank You! — spending a lot of much-needed money in it. Tomorrow afternoon, however, many of those Europeans will be passionately engaged in watching the UEFA Champion’s League Final between Barcelona and Manchester United, which starts at 2:45 p.m. and is being shown live on Fox. (Not Fox’s soccer channel, but its main channel — i.e., the one that shows “American Idol.”) However, expect many of them to be watching in bars and restaurants around the East Village and Lower East Side, including Nevada Smith’s, The Central Bar, etc. As will be plenty of other New Yorkers from around the world, including a healthy dose of native New Yorkers. Now for the match itself. What have we got? Grace Maalouf Soccer fans watch multiple live games on a recent Saturday morning at Nevada Smiths, an East Village institution where fans are split over the dismissal of several employees last fall. Our recent post on how patrons have responded to recent staffing changes at Nevada Smiths generated a wide range of feedback about the landmark soccer bar. Join the conversation: Soccer fans, what’s your take on the changes at Nevadas? Grace Maalouf Manchester United fans Leigh Mazzagetti and Marc McDermott watch a game at Nevada Smiths. The fallout from the departures of three longtime staffers caused several major soccer-team supporters’ clubs to leave the pub, which is something of an institution for local soccer fans. Grace Maalouf FC Barcelona fans watch their team play at Village restaurant Mercat. 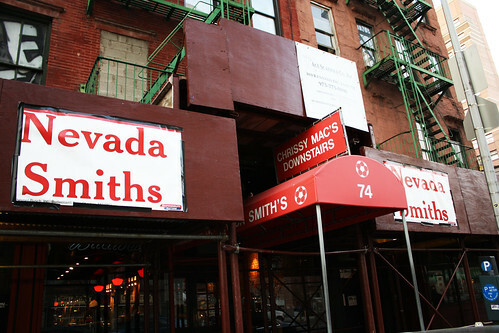 The Barcelona fan club moved their headquarters to the Catalan dinner spot after several staffers left Nevada Smiths. For a bar whose motto is “Where football is religion,” Nevada Smiths could be said to have suffered something of a Great Schism last year. As some sports fans (and East Village residents) may already be aware, two longtime staff members were fired in the spring and a third left in September. In addition, Thomas McCarthy, a co-owner of the bar, sold his shares to his partner and uncle and left the business. Although none of the people who parted as a result of the disputes would offer details, the fallout was serious enough to cause several major soccer-team supporters’ clubs to leave Nevada’s. Patrick McCarthy, now the sole proprietor of the bar, said the flight of some fans hurt but added that business now is good — and he’s looking to make changes at the Third Avenue mainstay. A colorful renovation may be in store for the trademark black awning, more rugby will be included in the viewing schedules and new food and drink offerings are in the works. Mr. McCarthy said he plans to innovate by adding coffee and shepherd’s pie to the beer-heavy menu. As for evergreen rumors about the bar changing locations, Mr. McCarthy said he knows “for a fact” that won’t happen. “There will always be a Nevada Smiths as long as I’m in New York City,” he said, adding that he’s even hoping to open one on the West Side. After experiencing controversy over the recent firings (it was, he said, like being “kicked in the head”) Mr. McCarthy said he is finished with drama. “I’ve moved on,” he said. C.C. Glenn Still reeling from the Jets’ playoff loss, the author considers some Super Bowl viewing options. As the 2011 NFL season comes to a close with a Super Bowl clash between the Green Bay Packers and Pittsburgh Steelers, there’s a detached air in New York City. There are no more random battle cries of J-E-T-S. Rex Ryan’s personal league-wide vendetta is a thing of the past. Green jerseys lay balled up in the back of closets or the bottom of dumpsters, stained with beers and tears. There’s a game left, but for us –– that is, Jets fans in the East Village and other parts of New York City –– the season’s over. We’re tired. We’re confused. For the first time since August, we have nowhere to turn. Since the football season began in August, many of us have gravitated toward the Jets, with their scrappy play. For New York City transplants, the gradual adoption of the Jets meant defecting not only from the Giants (the other “New York” team that plays in New Jersey) but also hopping fickly from less fortunate childhood teams in other states and cities. Throughout the team’s improbable playoff run, it felt like every New Yorker was a New York fan, every bar was a Jets bar.